Among these industry thought leaders was Brad Ewald, independent analyst with the BBBT, data and marketing solutions expert and Principal at Boulder Marketing Technology. Yellowfin BI presented their reporting solution to the Boulder BI Brain Trust (BBBT) on November 6, 2015. More information is available on the BBBT Website and the BBBT Podcast Page. In addition to attending the presentation, I took the opportunity to install the free trial and was impressed with what I found. The following summarizes my thoughts on Yellowfin. Yellowfin is a mature web-based application that is built for intuitive Business Intelligence (BI) and enterprise reporting. The solution’s sweet spot appears to be applications that require insights and reporting throughout the organization. Yellowfin is a great alternative to popular next generation BI solutions like Tableau and Qlik because it is competitive in terms of usage and data visualization. The tool also has very strong security and collaboration capabilities that trump what many of the other vendors in the industry offer. The Yellowfin solution is based on the premise that BI is only effective if it can be shared. Yellowfin takes it one step further with capabilities that include timelines with recent updates and comments related to a dashboard or report. The tool also includes a Kanban board that allows users to create and track tasks associated with a particular report. All these features allow users and developers to work more collaboratively without ever leaving the tool. The adoption numbers touted by Yellowfin are impressive. The graphic below emphasizes the focus on BI applications that have broad interest across the organization and the tool is setup to deliver this. Collaborative features – combined with compelling dashboards, visualizations, and stories about data – lead me to believe that the numbers below are the result of a thoughtful strategy that is aimed at delivering insights to end-users with little or no training on the tool. The solution includes features that enforce versioning of reports and dashboards so you can always roll back to the previous version. This takes a bit of time getting used to, but I would envision this working in the context of larger organizations with more specific administrative and development roles. Yellowfin also has a very granular security model that allows administrators to secure pretty much every feature within the system within an extensible set of customizable roles. The solution also supports report, dashboard, and row level security. Yellowfin produces crisp visualizations and it supports the display of additional dimensions and measures through the use of colors and bubble sizes similar to what is available in Tableau. I found it easy to create graphs and my only complaint was that it was difficult [to include] date intervals on a time series analysis, but I’m told there is a way to resolve this. The Yellowfin semantic layer is based on what they refer to as views. Views can be created using a visual modeling tool or by using Freehand SQL. I can see utilizing both options depending on the developer and the complexity of the logic in the reporting layer. Views provide developers and analysts with curated datasets, but the nature of views is such that they can be developed in a more agile fashion and released independently of each other for specific use cases. This approach helps address the tension between more governed data access and more agile development needs. Yellowfin BI is a complete tool that is appropriate for enterprise use. 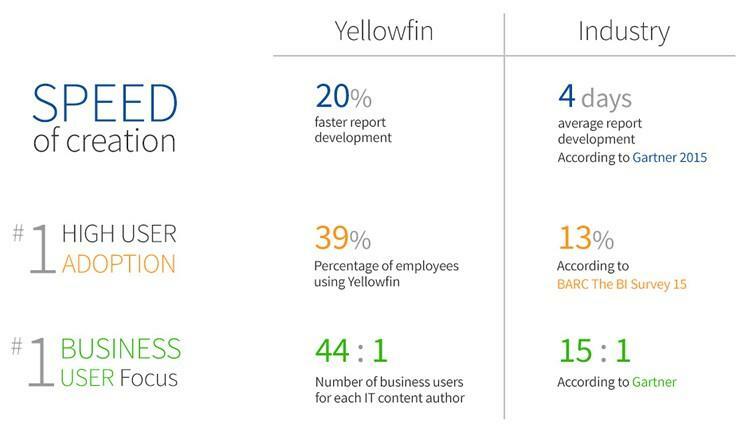 Over 10,000 organizations, and more than one million end-users across 70 different countries, use Yellowfin every day. For more information, visit www.yellowfinbi.com. Brad Ewald is an independent analyst with the BBBT. He is a data and marketing solutions expert and the Principal at Boulder Marketing Technology. Brad has more than 15 years of full life-cycle solution delivery and consulting experience. Brad has led numerous data warehouse and marketing database development efforts and specializes in CRM data integration, marketing automation, Business Intelligence, and large-scale marketing applications. You can follow Brad on Twitter @jbewald or contact him at Brad@Bouldermartech.com.